Hungry for the best cherries? Cherry Haven is the place to pick your own fresh cherries! Cherry Haven is a family-owned u-pick cherry orchard, overlooking the picturesque Yarra Valley in Victoria, less than an hour's drive from the Melbourne CBD. Cherry Haven is perfectly situated for producing quality cherries with the added benefit of great views and a delightful countryside environment for your day out. Our delicious cherries are grown as naturally and chemical free as we can. We were one of the first u-pick orchards in our area and specialise in providing our customers with a great day out. We provide customers with access to our whole orchard to ensure they are getting the best cherries available. 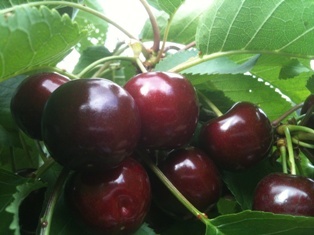 The excitment of picking your own cherries is like a treasure hunt, only in this game EVERYONE WINS! Explore over 30 different types of cherries in the orchard, and taste and find just the ones that YOU like best. Week to week during the season, varieties will ripen at different stages so every time you come there will be new mouth-water flavors waiting for you to try. But, don't be left out. The cherry picking season only comes around once a year in the Summer months. Head to our "About Cherries" pages for information about the types of cherries you will find at Cherry Haven as well as scrumptious recipes for you to try when you get home. Picking fresh cherries is a great family activity, or a romantic time for a couple, or come yourself and enjoy the peace & quiet of our orchard. Come give it a try! We hope to see you you soon -- among the cherry trees!